I was over at CBS/WLNY studios this morning filming a really fun segment on the NYC morning show Live From The Couch, which airs on WLNY 55. 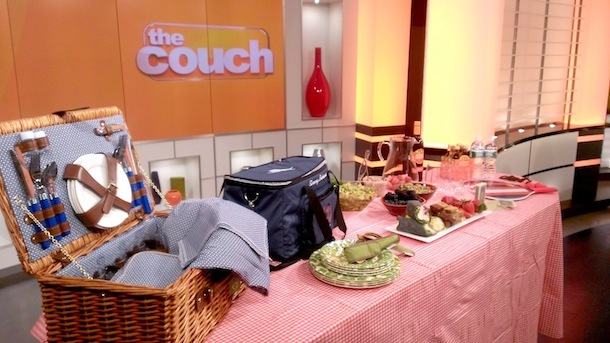 The segment was all about how to pack the perfect picnic basket, and I shared some of my best picnic food tips, as well as some very cool new products. 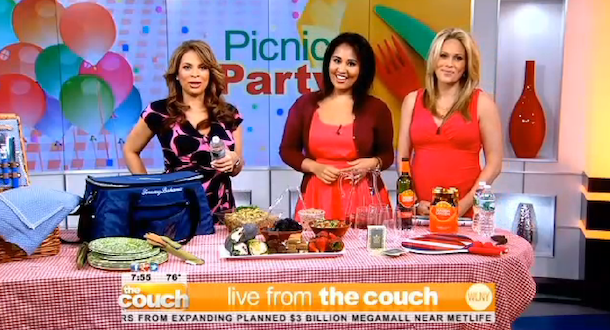 This was my first time doing a segment at The Couch, and they were all so great to work with. The hosts, Carolina and Lisa, and crew were all really lovely and helpful. That isn't always the case with all the TV shows, so it's always really amazing when you get to do a segment with such a cool group of genuinely nice people. I look forward to working with them again! This was also the first segment that my new intern, Ariana, got to join in on, and it was amazing having her to help me prepare and set up. I'm usually flying solo on these segments, and having someone to help makes all the difference in the world (plus it means I have pictures to share with you!). 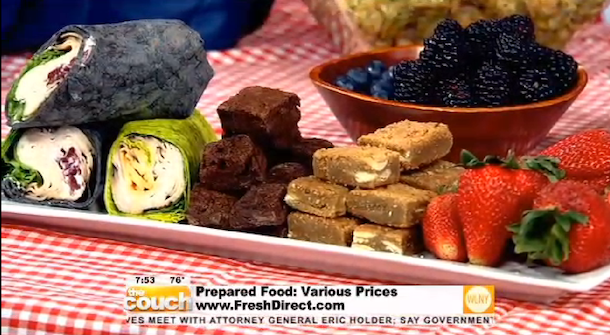 I also have to give a HUGE thanks to the folks at Fresh Direct, who provided all the delicious and beautiful food for the segment. The crew pretty much devoured all of it the second we were off the air. 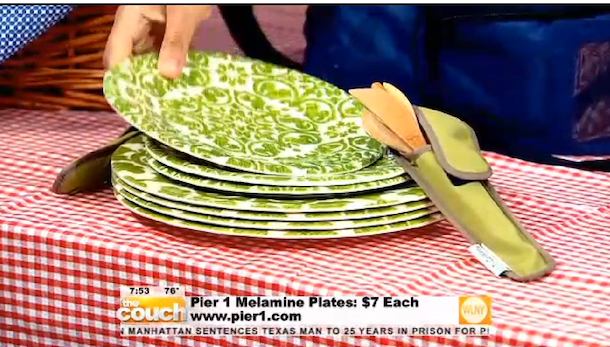 Click the video below to watch the segment & then scroll down to check out more details on the tips and products I mentioned on air. 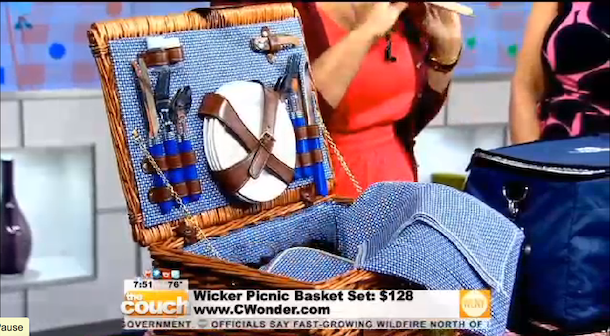 C. Wonder is one of my favorite stores in the city right (as evidenced by my closet and credit card statements), and this picnic basket is everything that I love about them--it's stylish and really elegant, but also super playful (tiny baby cheeseboard!). It comes with a service for four, napkins, removable insultated mini cooler, and even a waterproof picnic blanket! I am in LOVE with this cooler. It comes with a little slot in the front were you can slip in your iPod or smartphone and connect it to the built-in speakers on either side so you can play music at the beach or in the park. 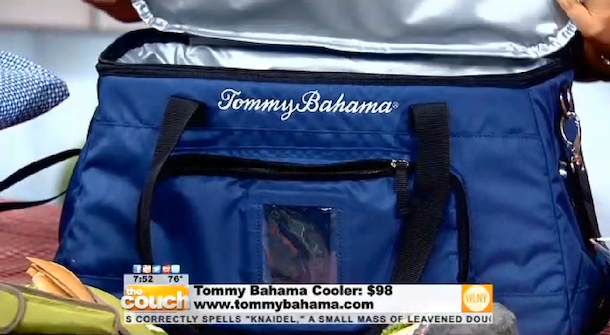 The inside is also a super roomy insulated cooler that will hold all your food and beverages. It's pretty much the best thing ever! I usually find that most blankets that are sold as actual "picnic blankets" are WAY too small. They're barely big enough for one adult to stretch out on, let alone a few. 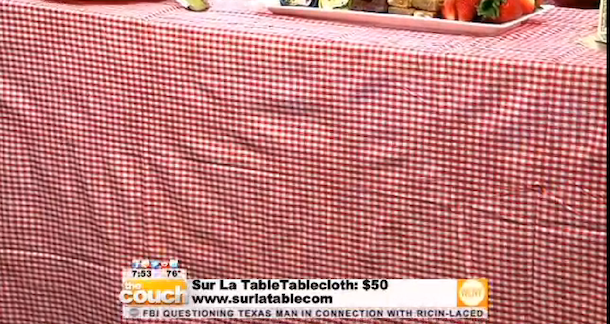 So I like to use extra large tablecloths, like this really pretty classic red gingham style from Sur La Table, instead. Plenty of room for everyone to spread out and relax while enjoying the food and sun. My new favorite for summer parties! 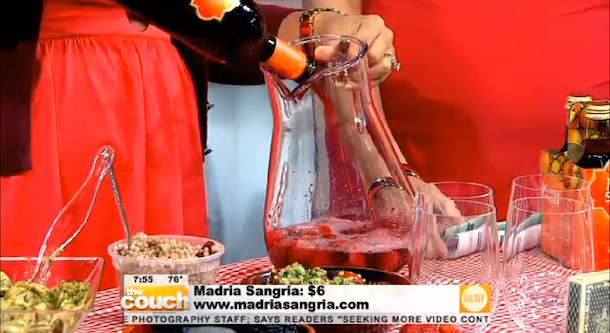 This lovely red wine is infused with natural citrus flavors, so all you have to do to make the perfect pitcher of sangria is chill and add fruit! 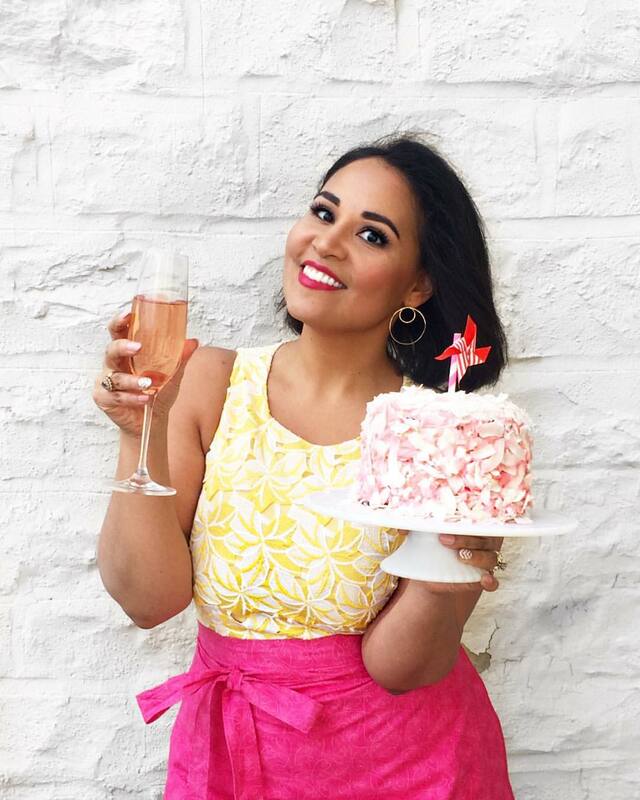 As I mentioned in my last sangria recipe post, I'm not a fan of super sweet sangria, which is why I love this--it's perfectly balanced and not at all sickly sweet. Add it to a pitcher with a few handfuls of frozen or fresh fruit and you're good to go!